Control of protein synthesis (translation) is vital for cell proliferation and differentiation. Initiation of translation is typically rate-limiting and is the main target of regulation. In cancer cells, multiple components of the translation initiation machinery are up-regulated in response to the demand for high rates of protein synthesis. The potential of using inhibitors of translation initiation for anti-cancer therapy was demonstrated in recent years and currently presents an active area of research. Translation initiation is the process of locating the correct translation start codon on the mRNA and the assembly of an active ribosome, ready for translation. It requires a number of eukaryotic translation initiation factors (eIFs) and consists of several steps: initiation complex assembly; binding to mRNA; scanning; start codon recognition; and finally joining of the large ribosomal subunit to form a ribosome with a bound initiator Met-tRNAi ready to translate the mRNA. The initiator Met-tRNAi is delivered to the ribosome as a complex with eIF2-GTP. One eIF2-GTP:Met-tRNAi complex is “consumed” in every translation initiation cycle, with release of eIF2-GDP and deacylated initiator tRNAi. Regeneration of the eIF2-GTP:Met-tRNAi complex from eIF2-GDP and Met-tRNAi is catalyzed by the nucleotide exchange factor (GEF) eIF2B (reviewed in Marintchev and Wagner, 2004). Our work is focused on studying the architecture of the translation initiation complexes, the molecular mechanisms of key steps in the process, and their regulation. The long-term goal is to build a detailed mechanistic and quantitative model of translation initiation as a whole, and learn how to rationally manipulate the system for the purposes of cancer therapy and treatment of metabolic disorders. Two areas of particular interest are the coordination between start codon selection and ribosomal subunit joining (circled with blue in the figure below) and the regeneration of the eIF2-GTP:Met-tRNAi complex (circled with red in the figure below). 1. Luna, R. E., Arthanari, H., Hiraishi, H., Nanda, J., Martin-Marcos, P., Marcus, M. A., Akabayov, B., Milbradt, A. G., Luna, L. E., Seo, H-C., Hyberts, S. G., Fahmy, A., Reibarkh. M., Miles, D., Hagner, P., O’Day, E. M., Yi, T., Marintchev, A., Hinnebusch, A. G., Lorsch, J. R., Asano, K., Wagner, G. The C-Terminal Domain of Eukaryotic Initiation Factor 5 Promotes Start Codon Recognition by Its Dynamic Interplay with eIF1 and eIF2β. Cell Reports, 1(6), 689-702. (2012). 2. Abaeva, I. S., Marintchev, A., Pisareva, V. P., Hellen, C. U. T. & Pestova, T. V. Bypassing of stems versus linear base-by-base inspection of mammalian mRNAs during ribosomal scanning. EMBO J, 30(1), 115-29. (2011). 3. Yu, Y., Abaeva, I. S., Marintchev, A., Pestova, T. V., Hellen, C. U. Common conformational changes induced in type 2 picornavirus IRESs by cognate trans-acting factors. NAR, 39(11), 4851-65. (2011). 4. Yu, Y., Marintchev, A., Kolupaeva, V. G., Unbehaun, A., Veryasova, T., Lai, S. C., Hong, P., Wagner, G., Hellen, C. U., Pestova, T.V. Position of eukaryotic translation initiation factor eIF1A on the 40S ribosomal subunit mapped by directed hydroxyl radical probing. NAR, 37(15), 5167-82. (2009). 5. 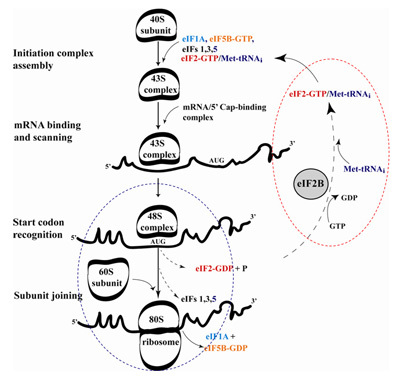 Marintchev, A., Edmonds, K. A., Marintcheva, B., Hendrickson, E., Oberer, M., Suzuki, C., Herdy, B., Sonenberg, N., Wagner, G. Topology and regulation of the human eIF4A/4G/4H helicase complex in translation initiation. Cell, 136(3), 447-60. (2009). 7. Lindqvist, L., Oberer, M., Reibarkh, M., Cencic, R., Bordeleau, M-E., Marintchev, A., Tanaka, J., Fagotto, F., Altmann, M., Wagner, G. & Pelletier, J. Selective Pharmacological Targeting of a DEAD box RNA helicase, PLoS ONE, 3(2): e1583, (2008). 9. Unbehaun, A., Marinchev, A., Lomakin, I. B., Didenko, T., Wagner, G., Hellen, C. U. T., & Pestova, T. V. Position of eukaryotic initiation factor eIF5B on the 80S ribosome mapped by directed hydroxyl radical probing, EMBO J, 26, 3109-3123, (2007). 10. Marintchev, A., Frueh, D., & Wagner, G. NMR methods for studying protein-protein interactions involved in translation initiation. Meth Enz, 430, 283-331, (2007). 11. Gelev, V., Aktas, H., Marintchev, A., Ito, T., Frueh, D., Hemond, M., Rovnyak, D., Debus, M., Hyberts, S. G., Usheva, A., Halperin, H., & Wagner, G. Mapping of the auto-inhibitory interactions of protein kinase R by nuclear magnetic resonance. JMB, 364(3), 352-63, (2006). 12. Yamamoto, Y., Singh, C. R., Marintchev, A., Hall, N. S., Hannig, E. M., Wagner, G., & Asano, K. The C-terminal HEAT domain of eIF5 mediates multifactor assembly and scanning with distinct interfaces to eIF1, eIF2, eIF3 and eIF4G. PNAS 102(45), 16164-9 (2005). 13. Marintchev, A. & Wagner, G. eIF4G and CBP80 share a common origin and similar domain organization – implications for the eIF4G structure and function. Biochemistry 44(37), 12265-72 (2005). 14. Oberer, M., Marintchev, A. & Wagner, G. Structural basis for the enhancement of eIF4A helicase activity by eIF4G. Genes Dev 19(18), 2212-23 (2005). 15. Marintchev, A. & Wagner, G. Translation initiation: structures, mechanisms and evolution, Q Rev Biophys 37(3-4), 197-284 (2004). 16. Ito,T., Marintchev, A. & Wagner, G. Solution Structure of Human Initiation Factor eEF1B Reveals Homology to the Elongation Factor eEF1B. Structure (Camb) 12(9), 1693-704 (2004). 17. Marintchev, A., Kolupaeva, V. G., Pestova, T. V. & Wagner, G. Mapping the binding interface between human eukaryotic initiation factors 1A and 5B: a new interaction between old partners. PNAS 100(4), 1535-40 (2003). 18. Lomakin, I. B., Kolupaeva, V. G., Marintchev, A., Wagner, G. & Pestova, T. V. Position of eukaryotic initiation factor eIF1 on the 40S ribosomal subunit determined by directed hydroxyl radical probing. Genes Dev 17(22): 2786-97 (2003). 19. Marintchev, A., Gryk, M. R. & Mullen, G. P. Site-directed mutagenesis analysis of the structural interaction of the single-strand-break repair protein, X-ray cross-complementing group 1, with DNA polymerase β. NAR 31(2), 580-8 (2003). 20. Gryk, M. R., Marintchev, A. & Mullen, G. P. Mapping of the interaction interface of DNA polymerase β with XRCC1. Structure (Camb) 10(12), 1709-20 (2002). 21. Maciejewski, M. W., Shin, R., Pan, B., Marintchev, A., Denninger, A., Mullen, M. A., Chen, K., Gryk, M. R. & Mullen, G. P. Solution Structure of a Viral DNA Repair Polymerase. Nature Struct Biol 8(11), 936-41 (2001). 22. Pan, B., Maciejewski, M. W., Marintchev, A. & Mullen, G. P. Solution structure of the catalytic domain of γδ-resolvase. Implications for the mechanism of catalysis. JMB 310(5), 1089-107 (2001). 23. Wu, H., Maciejewski, M. W., Marintchev, A., Benashski, S. E., Mullen, G. P. & King, S. M. Solution structure of a dynein motor domain-associated light chain. Nature Struct Biol 7(7), 575-9 (2000). 24. Marintchev, A., Robertson, A., Dimitriadis, E. K., Prasad, R., Wilson, S. H., & Mullen, G. P. Domain specific interaction in the XRCC1-DNA polymerase β complex. NAR 28(10), 2049-59 (2000). 25. Marintchev, A., Mullen, M. A., Maciejewski, M. W., Pan, B., Gryk, M. R. & Mullen, G. P. Solution structure of the single-strand break repair protein XRCC1 N-terminal domain. Nature Struct Biol 6(9), 884-93 (1999). 26. Marintchev, A., Maciejewski, M. W. & Mullen, G. P. 1H, 15N, and 13C resonance assignments for the N-terminal 20 kDa domain of the DNA single-strand break repair protein XRCC1. J Biomol NMR 13(4), 393-4 (1999). 27. Marintchev, A., Mirtcheva, J., Sidjimov, A. & Haimova, M. Induction of lymphoproliferative popliteal lymph node reaction by hydantoin derivatives: structure-activity relationships. Int J Immunopharmacol 17(12), 981-4 (1995).